The first project in my ceramics class was a coil pot I had to make replicating a pot made nearly 8000 years ago. 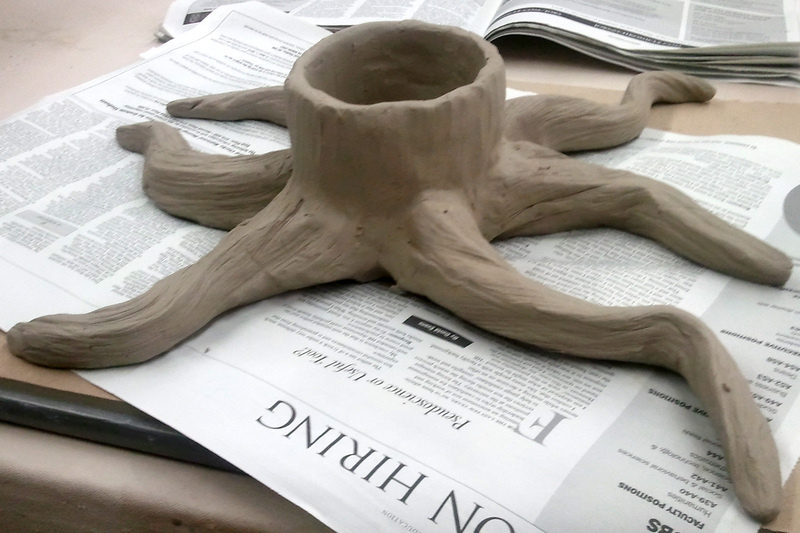 The second project in class has been to create a metaphorical vessel. We were instructed to think of the thing or things that were most precious or important to us, and think about what type of vessel could be created to hold them metaphorically. Additional requirements for the vessel were that it had to actually be open or able to open and we had to be able to explain why it represented us. For me, the things that are most important to me are my daughters, Emma, Harley, and Reagan. Also very important to me are nature and photography. I tried to think of some sort of vessel that could represent a vessel for all of those things, but I wasn’t able to. Initially with the girls, I thought of making something that represents the sea, since I refer to us as the Sea of Estrogen, and I even tried making several mock-up wave forms. Nothing I came up with worked very well, though, and I scrapped the ocean/sea idea. It was only after thinking about the past two years of our lives that I came up with my project idea. I decided to create a dead tree stump/snag. The dead tree represents our old life; the life we had to leave behind. The roots of the tree are still strong and hold it upright. Our family dynamic is very public – one mother and three daughters, but our individual relationships are unique, private, and sacred. Once a tree dies it does not just rot, decay, and absorb into the ground, rather, it becomes a vessel for new life. Wildlife use the tree for shelter, plants use the decaying wood to grow, and birds frequently make nests in tree snags. Even through death and loss, new growth and new life develop and thrive. I used the coil-building method to create my tree, and I used the surface of a piece of dead wood to create the texture on my sculpture. 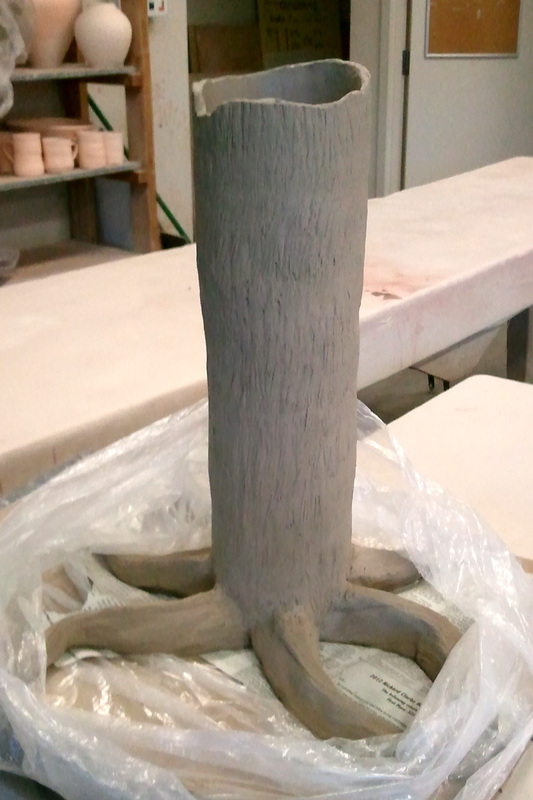 When I first started making my sculpture, it reminded me of an octopus which I thought was funny. The entire trunk of the tree is hollow, but it has a floor/ceiling approximately halfway up the trunk separating the top from the bottom. The opening in the top has a small lip about two inches below the top. The lip will hold the top/lid of the trunk. The top half of the trunk represents the public portion of our family – my girls and me. The bottom half of the trunk is only accessible by lifting up the tree and turning it upside down – it is a hidden vessel. This section of the trunk of the tree represents the private, sacred relationships that exist between each of my girls and me and the relationships they each have between them as sisters. It encapsulates what is most valuable and precious to us – our love, caring, and understanding of one another. Just like many trees in the woods, I carved our names in trunk of of the tree. This is my family – the thing that is most precious to me. On the other side of the tree, I carved a heart to represent the love that holds the four of us together. I have made two tops for my tree, and I am still somewhat torn about which one to use. The first is supposed to look like broken off pieces of wood, and it’s okay, but didn’t turn out exactly how I wanted. The second is just a flat plate with a handle that won’t show above the top of the tree. I probably won’t decide which I like better until it’s all fired and glazed. When we first received this assignment, I was really irritated because I don’t like trying to express my “self” in art (I know – that’s somewhat of a contradiction in and of itself.). Once I started working, though, I began to enjoy it and really like building it. So, today, St. Valentine’s Day, seems the most appropriate for sharing something that is so meaningful and important to me – my girls and how I view us and our family.